Just how important is integrity in leadership? The research I did for my first book (Women and Leadership in Health Care) concluded that integrity is the single most important factor in perceived leadership effectiveness in both women and men. It is more important than competence, “likeability,” ability to get things done, being visionary and everything else we may think is required for great leadership. How does this strike you? The way it strikes me is that it is obvious, particularly when it’s documented with evidence. So, if it’s obvious, then it must follow that we would naturally act with integrity when we are in leadership roles and situations, right? I would like to think that most of us do lead with integrity, most of the time. But, as my (informal) research for my newest book, Leading Valiantly, revealed, we don’t always lead the way we know is right. Stuff gets in the way. So, what’s the stuff? Some of it is that there are just too many distractions. These distractions are the endless activities that can take us away from our core beliefs, values and aspirations. They are the sometimes relentless demands that pull us away from ourselves and into the enticing world of the here and now and its compelling call for engagement and expedience. Sometimes the distracting stuff is the blessing and curse of 24/7 connectivity. How many ways can we stay in touch with our colleagues, friends, and the frontiers of our personal/professional online communities? Do our smart phones make us smarter simply by being on? Or do they serve us best when we use them in ways that help us stay focused and supported rather than busy and distracted? There are literally hundreds – probably thousands – of ways to be distracted. 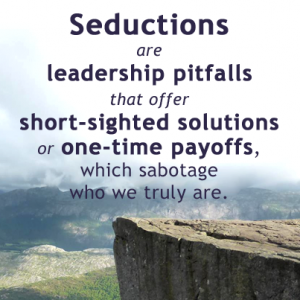 Distraction is one of the Leadership Seductions I explore in Leading Valiantly. 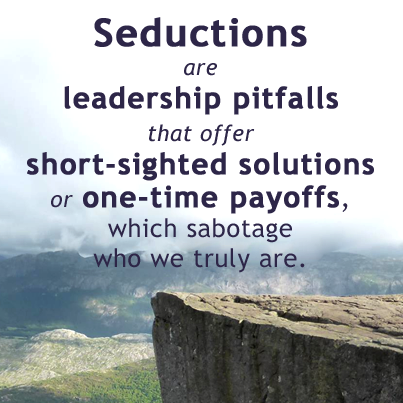 This and the other Seductions are important because they can take us out of ourselves and away from our best leadership intentions and abilities. When we leave that space, it’s likely that we are not operating with the full complement of our skills, values, beliefs and the greatest leadership asset we have – our deep and abiding integrity. This entry was posted in Blog and tagged Distraction, Healthcare, Integrity, Leader, Leaders, Leadership, Seductions. Bookmark the permalink.